Steampunk Weather Gauge for Windows PC and Mac OS is a beautiful widget with detailed retro clock style design.The widget is available for both Windows and Mac. Not only the widget is beautiful, the illustrative image shows the dedication level of the developer too. 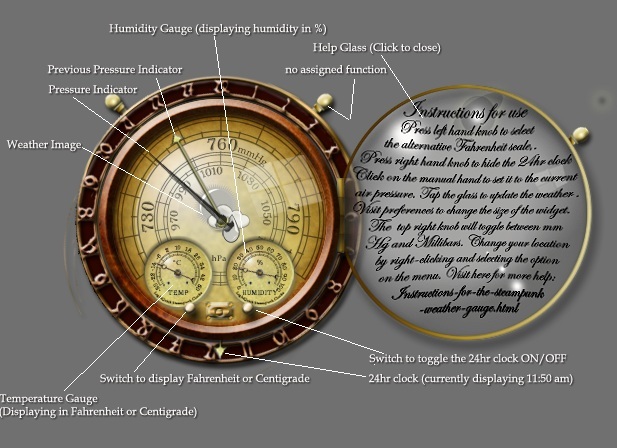 Steampunk Weather Gauge is developed by yereverluvinuncleber. This widget requires Yahoo widgets to operate. Download yahoo widgets from here or just download the Download the Konfabulatorâ„¢ SDK and it has all you need to get started. The Mac version of the Yahoo widget engine is different. Also, detailed instruction is written by the developer here. It is a Widget download, the file is 2.4 MB in size. This Article Has Been Shared 8683 Times! Mac Style Boot Skin For Windows 7 is a replacement bootskin for Windows 7 PC. It can be used with some nice Mac looking Windows 7 Theme. Cite this article as: Abhishek Ghosh, "Steampunk Weather Gauge for Windows PC and Mac OS," in The Customize Windows, March 19, 2012, April 21, 2019, https://thecustomizewindows.com/2012/03/steampunk-weather-gauge-for-windows-pc-and-mac-os/.